A Fitzroy cafe where you can eat croquettes and churros for breakfast. When you start the day with a clacked egg, you can be fairly certain it won't be an ordinary day. And when you go on to have churros dipped in melted chocolate, well, things are likely to get crazy. Tapas may not be your go-to for breakfast, but that will change once you visit Nomada Café y Tapas in Fitzroy. Housed in what was formerly home to Hammer and Tong, the newly-opened cafe comes from the super crew of Jesse Gerner (owner at Bomba, Anada, Green Park and Samuel Pepys), Michael Burr (Bomba), Jesse McTavish, Greg McFarland (both ex-The Kettle Black) and Shane Barrett. Any thought of morning chill, the day ahead or what Donald Trump might do next is banished once you step over the threshold into the cosiness of the refurbished interior. Think the Spanish villa you've been ogling on Airbnb — lots of wooden bric à brac (well, okay, rolling pins), large old-school fishing net lightshades and fluffy alpaca skins slung over the backs of the long bench seat that runs along the window. Shelves bear a collection of plants, Spanish glass bottles and pottery, and Burr's laidback playlist hums in the background. But back to the clacked egg. Just so you can bring this up next time you're in erudite company and need an edge, a clack is a tool that perfectly takes the top off an egg without damaging the rest of it. At Nomada, once clacked, the egg is removed and made into a rich hollandaise with a little mushroom powder, sweet corn, potato and jamón. 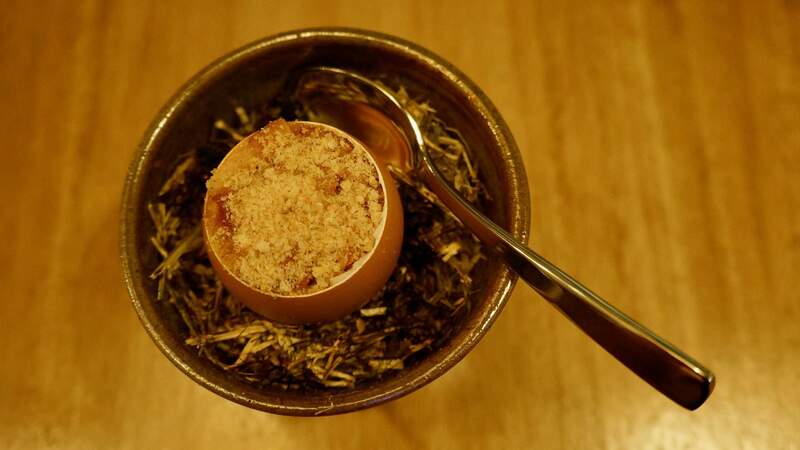 Then the mixture is poured back in to the egg shell and served perched on burnt hay. The presentation, aroma and beautiful mouthful of umami flavour makes this a little soul-filling treat — especially at breakfast. Coal-blistered tomatoes with sherry, scattered herbs and a flurry of Manchego pair well with house sourdough and house-made butter, with the plump little cherry tomatoes offering a burst of juicy flavour. Otherwise, the menu offers a selection of tapas dishes at $5, $9, $15 and $19 so you can put together your own breakfast of Spanish delights, amongst them, house-cured anchovies, salted blue eye croquetas and sweet pumpkin porridge. If it's closer to lunchtime, something like the Angus hanger sandwich might offer a more hearty option. It's not a Spanish breakfast without churros and these babies are the real deal: super light and crunchy with just the perfect amount of cinnamon sugar and melted chocolate. They're made even sweeter by the fact that you can eat them before midday. From Thursday, June 8, Nomada will open for dinner on Thursday, Friday and Saturday nights.